How Can Uniforms Improve Your Productivity? | Ace Uniform Services, Inc. The benefits of uniforms actually go far beyond what your customers see and think of them. A standardized uniform in your business could actually improve employee performance, including your own. There are certain businesses where a customer walking in will expect to see a consistent uniform: on the waitstaff in a restaurant, on the medical professionals in a clinic, on the athletes playing a professional sport on the field, and on the military personnel on a base. But those aren’t the only places that we see employees in a standard uniform. This is because the benefits of uniforms actually go far beyond what your customers see and think of them. A standardized uniform in your business could actually improve employee performance, including your own. Most people know about “dressing the part,” which comes down to the idea that when you look more professional, people will assume that you are and that you know what you’re doing. This also extends to how you see yourself. When you look professional and knowledgeable, your self confidence grows. In fact, having a professional looking uniform can actually increase professional behavior in employees as they start to “act the part” too. When in uniform, they have a sense of representing the company and start to act in accordance with that. Having a uniform for your employees gives them a confidence boost that allows them to take control of their position. This sense of your employee’s confidence and knowledge will be apparent to your customers and increase their perception of your employees as well. 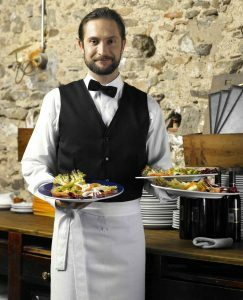 Having an appropriate uniform instantly conveys that your employee knows what they’re doing and customers respect that. Customers will be more likely to listen to and respect your employees when their uniform signals that they have the authority and the knowledge to make the right decisions. Have you ever decided on a new years resolution to work out more and instantly gone to the store to buy new gym clothes? People do this very often because the gym clothes actually increase our motivation to go work out since we “look the part.” A clean, professional employee uniform can increase employee motivation in the same way as those new gym clothes. Employees who look the part have a greater drive to get the work done, improving the productivity of your business overall. Allowing employees to choose their own outfits or to dress casually can often have the opposite effect as well. If someone is wearing something that they associate with relaxing or being at home, they tend to be less focused and productive. This entry was posted on Friday, December 7th, 2018	at 9:32 am	. You can follow any responses to this entry through the RSS 2.0	feed. Both comments and pings are currently closed.